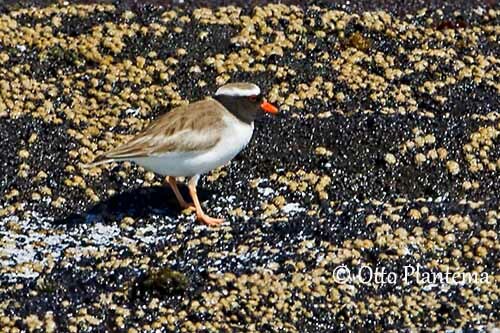 The Shore Plover is today a rare species restricted to some of the Chatham Islands. There is only one self-sustained population. Captive breeding programs and translocation of birds to predator-free islands allowed the foundation of additional small populations, but predator incursions have again affected these newly established birds. The Shore Plover is one of the world’s rarest shorebird. This small shorebird has grey-brown crown and upperparts with dark brown mottling. The bird in flight shows conspicuous white wingbars and the white sides of rump and tail. The underparts are white, including underwing-coverts and axillaries. There is only some brownish shade under the primary coverts. On the head, the male has distinctive black face mask including forehead, lores, chin, upper throat and sides of face. The black extends around the hindneck as a narrow collar. A white circular head band separates the brown crown from the black face mask. The fairly long, pointed bill has orange base and blackish tip. The eyes are dark brown, surrounded by narrow red-orange eyering. Legs and feet are dull orange. Both sexes are almost similar, but the female has dark brownish facial mask (not black), and duller orange bill base. The juvenile has whitish face with broad, dark brown eye-stripe. The bill is mostly brown with reduced orange tinge at base of lower mandible. The black face mask appears at about six months of age. 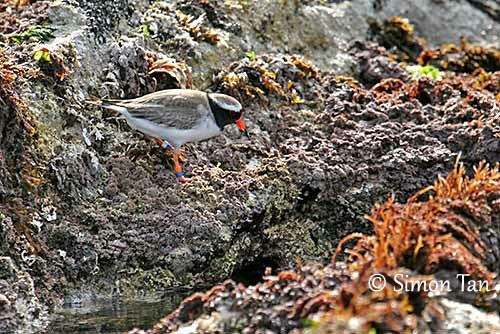 The Shore Plover is found in the Chatham Islands where its range is continuing to reduce while predators are spreading. There is a population on Rangatira Island, and a small other population was discovered on Western Reef, but the latter declined rapidly. A small population has been reintroduced on Mangere Island. Another population was founded on New Zealand mainland in 1990s, by using eggs from Rangatira Island. 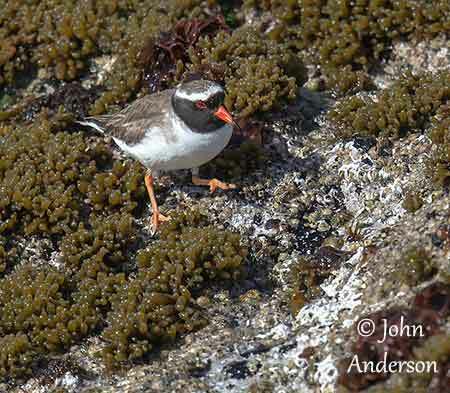 The Shore Plover breeds on two islands, Waikawa/Portland and Mana Islands. 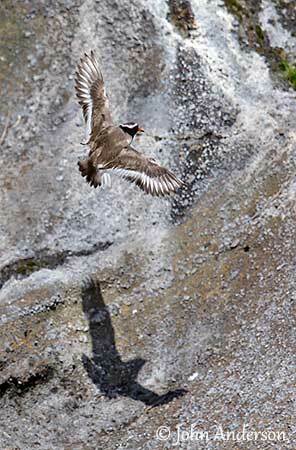 The Shore Plover frequents the wet rocky platforms on the shores of the islands, where shallow tidal pools provide it marine invertebrates. The nests are built among vegetation or boulders, although some birds breed on an elevated salt-meadow. 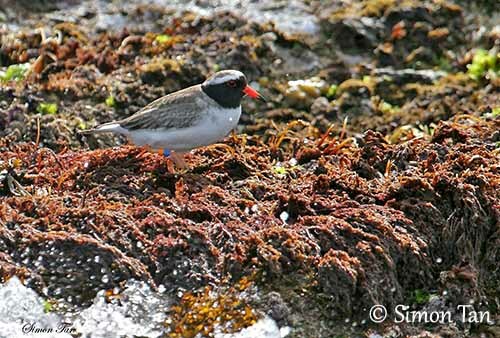 The reintroduced birds use a variety of habitat types such as sandy and shingle beaches, rocky platforms and shorelines, and tidal estuaries. During the breeding season, the Shore Plover defends the territory and the nest-site, but also a feeding area and another area for chick-rearing. They are monogamous with long-term pair-bonds. They show high fidelity to site and mate. The male performs a butterfly display flight around the territory, with slow wingbeats. The Shore Plover is sedentary, and only local movements are observed outside the breeding season. The juveniles visit other habitats once independent, but they often return to their natal areas. It has fairly rounded wings and only performs short distance flights, but it is a strong flier. The Shore Plover has restricted range and extremely small population. However, recent data suggest that numbers are slowly increasing while additional populations are established on predator-free islands. The population was estimated at about 200-220 birds in 2008, with 156-166 birds (78-83 pairs). Following translocations, there was about 94 pairs by 2010, but due to predator incursions at two sites, the numbers had fallen to about 60-65 pairs by early 2013, and there are 6-10 captive pairs. The Shore Plover is classified as Endangered for these reasons. In New Zealand, it is evaluated as Nationally critical. Conservation effort is essential. The laying occurs in October until December/January if a replacement clutch is done after nest-failure. The nest is placed under thick vegetation or boulders or among rocks. On salt-meadow, it is placed under tree-roots or logs. This is a cup-shaped scrape made with roots and dried grass. The cup is lined with plant materials or feathers, pebbles and shells. The female lays 3 pale olive eggs with dark vermiculations overall. Both adults share the incubation during 28 days, the female by day and the male mostly at night. At hatching, the chicks are covered with mottled buff, brown and white down above and creamy-white below. They fledge between 29 and 63 days after hatching, according to the food resources, but usually between 35 and 45 days. They are independent within one month after fledging. The adults may perform distraction displays to lead intruders away from the nest-site. Nest failures are due to storms involving destruction of eggs and chicks, and predation by Silver Gull and Brown Skua. A replacement clutch can be laid until January. The Shore Plover is highly vocal. It gives loud ringing calls and louder “kleet” or “splew” when flushed. The contact call between mates is a “pip”. During disputes, the adults give a loud ringing rattle. Juveniles and females give higher-pitched calls than adults and males. 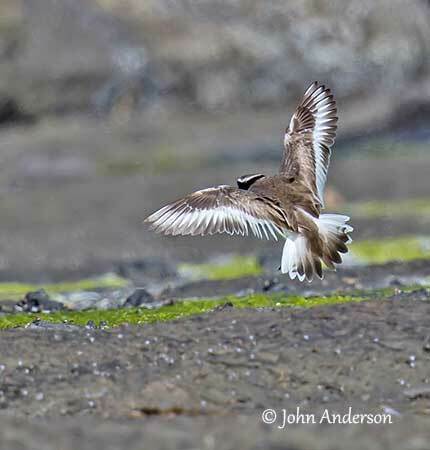 The Shore Plover feeds on a large variety of invertebrates taken on the shoreline or on land. Its diet includes small crustaceans, spiders, gastropods, bivalves and insects. In the salt meadow, it takes hemiptera, caterpillars and larvae. It forages on wet rock platforms along the sea shores, by performing rapid pecking action, and sometimes foot-trembling technique. It is active by day and also feeds extensively at night. Outside the breeding season, small groups of 10-15 birds can be formed for foraging and roosting.